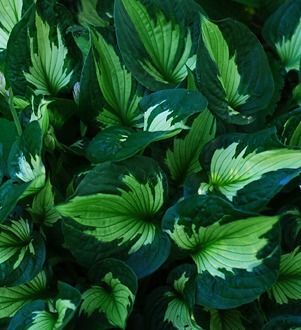 Hosta ‘Whirl Wind’ - Leaf colour changes continuously throughout the season - In spring, the leaf centre is creamy white with greenish veining, then turns light green by midsummer, and finally dark green in late summer. Unique growth habit with the pointy leaves held upright in a wavy mound. Slug resistant.